Ben Gallagher holds a photo of his dad, Shaun, doing an experiment with him. ALUMNI | Shaun Gallagher, AS02, was putting his young son back to bed in the middle of the night when he had one of those fleeting thoughts that can seem brilliant to the sleep-deprived: Maybe he could write a book that would encourage other parents to learn about child development by using their own babies and toddlers as research subjects. He talked it over with his wife, Tanya Gallagher, AS04, who at the time was expecting their second child, and the two decided the idea was worth pursuing. With a background in journalism and a lifelong interest in science, Shaun Gallagher figured he could base the book on academic experiments conducted by child-development researchers but also make that work understandable, accessible and fun for parents. 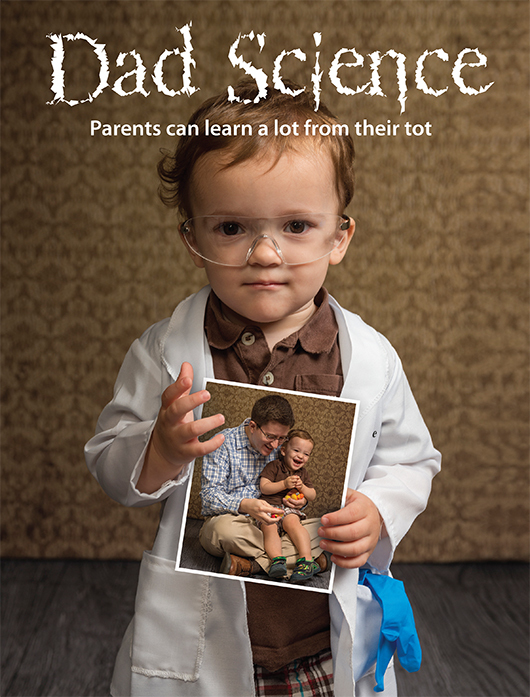 After teaching himself how to locate a literary agent and write a book proposal, Gallagher successfully found a market for Experimenting With Babies: 50 Amazing Science Project You Can Perform on Your Kid, published in October by Perigee, a division of Penguin Books. When people see the title, he says, they often get the wrong idea, envisioning children being subjected to dangerous experiments or parents becoming anxious about their child’s rate of development. In contrast, Gallagher says he wrote the book specifically to avoid both of those negative scenarios. “The word ‘experiment’ might sound scary or dangerous, but when you look at the research that child development experts actually do with babies, it’s totally different,” he says. “And I intentionally stayed away from any experiment that I thought parents would use to see if their child ‘measured up’ in some way. Place two small open-top boxes in front of your baby and within easy reach, show her a toy and let her watch you place it in one of the boxes. Allow the baby to remove the toy from the box. Repeat this several times, always putting the toy in the same container. Then, place the toy in the other box. Young babies will reach toward the original box even though they saw you put the toy in the other one. But by around their first birthday, they’ll reach for the new box. The experiments in the book include one that demonstrates the so-called stepping reflex. Parents who try out this experiment at different times during their child’s first year of life will see how the reflex is present in early infancy, then fades away and later returns when the baby is ready to walk. Other experiments show how babies develop different preferences in reaching for objects and ways in which they follow a parent’s lead in choosing a toy, for example, or trying a new food. The experiments are labeled according to the simplicity or complexity of duplicating them, the appropriate age of the child involved and the area of research, such as cognitive development, motor skills or language development. In all cases, Gallagher used the underlying academic research as his starting point. Gallagher now is a software engineer for a company that works with online retailers, and his previous jobs in journalism involved some programming and database research, but he never wanted to give up writing. The book, he says, is his outlet—and not the only one. The publisher offered Gallagher a two-book deal, and his book about correlations is scheduled to come out next summer. The Gallaghers, whose family now includes two boys, decided to celebrate parenthood along with Shaun’s writing success. They are donating 15 percent of the Experimenting With Babies royalties to Show Hope, a nonprofit that supports orphaned children and adoptive families.